Working with ESXTOP can be very tricky. The tool provides a large number of values but the names are partially shorten not very meaningful. Another challenge is to know the thresholds indicating a problem. 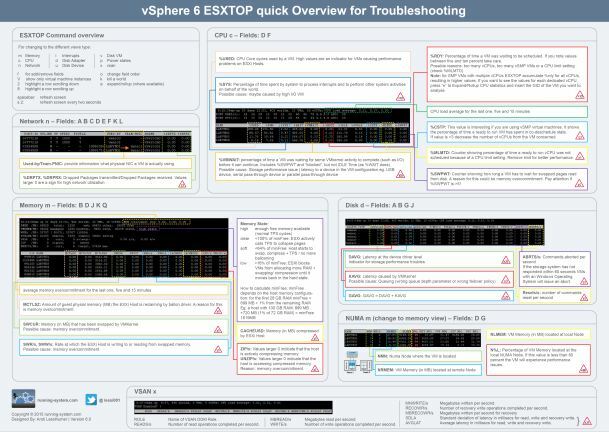 To make life easier, I’ve created the “vSphere ESXTOP quick overview for troubleshooting” poster 2013 for vSphere 5 and updated it for vSphere 5.5. The poster is provided as an A3 download, if you have eagle-eyes you can fit it to A4 when you print it. If you think that there is something missing or wrong, do not hesitate and let me know. Great resource for troubleshooting. Bookmarked! I have posted a link to this page on my blog, very good job. Great job, very helpfull! Thanks! NHN not NMN in the NUMA section. Could you please update the chart for both ESXi 6.5 and ESXi 6.7? this is so awesome. thank you. will you have one for 6.5 and 6.7?